Published in the Dover Express, 15 May, 1981. On the east side, the corn mill, erected by Mr William Kingsford in 1815, and which, in 1863, was taken in hand by the Mannerings, flourished for many years. Willsher Mannering, the elder, was not associated with this Buckland mill. In his day he ran, concurrently, the Town, Stembrook and Crabble corn mills, and, in the early part of his time, was not altogether dependent on local demands, much of his flour going by hoys to London; but, after seventeen years of remarkable business activity, he died in 1853 before his sons were old enough to carry on the business that he had built up. His executors carried on the two mills in the town, and the Crabble one was let. In 1862 his son Mr Willsher Mannering having finished his education, entered into the business, and in 1863 he hired this Buckland Mill, which, up to that time, had been carried on by Mr Edward Pilcher. Two years later, in 1865, Mr Willsher Mannering bought the mill, which was then only a wooden structure, the site of the later steam mills and stables being a pleasant garden, in the centre of which was a large mulberry tree, which formed a feature of much public interest at that period. In 1870 Mr Edward Mannering joined his brother in the partnership, and the mills in the town being given up, they united their energies in perfecting the milling process at Buckland. Although they possessed there the pick of the river Dour water power, after a few years’ work they found it necessary to supplement it by steam. The Mannerings led the way in modern milling methods. In the year 1870 they first used silks instead of the older way of separating the offal from the flour, this being the first introduction of silk dressing in this neighbourhood. In 1876 Mr Philip Stiff built for them the mill building which survives, on the south side of the older one. At first, the new structure was roofed to three storeys high, but it was afterwards decided to add two storeys more, and that was successfully accomplished by raising the roof en masse, and building under it. The introduction of steam power was quickly followed by modem milling machinery, put in year by year, as new inventions were tested, until the Buckland mill became one of the principal local industries. Now alas, the mill is only a store. Barton, as a general term, comprises, in longitude, that modem wide thoroughfare extending from Frith Road to the old Tram Shed at Buckland, now Hollis Motors’ Showroom, and, in latitude, nearly all that lies between the river and the Dover and Deal Railway. In ancient times the name of Barton was attached to a manor, which had its house between the river and Barton Road, the lands of which stretched across the valley to the Manor farm at Coombe at the western extremity of Buckland Bottom. This Barton Manor belonged to the Dover Priory, and, at the Reformation, passed to the Archbishop of Canterbury. The Manor of Buckland was entirely separate from this, and after the deposition of the Bishop of Bayeux, in the time of the Conqueror, was granted to Hamo de Grevequer, continuing in private hands, including the Willoughbys, the Barries, the Alkams, the Collards, the Fogges and the Shermans. The latter held it about the year 1656, and after the restoration of the monarchy, sold it to Mr Edward Wivell, of Croydon, who married the daughter of Captain William Stokes, Mayor and MP for this town, and settled in Dover. Mr Wivell’s daughter carried the Buckland Manor by marriage to the Gunman family; and Mr James Gunman eventually became its owner, A large portion of the original Buckland Manor, which descended from the Crevequers, forms the north-western part of Sir William H. Crundall’s Barton Estate. The road which in olden times passed behind Barton Farm was commonly described as “the back o’ Barton.“ It was a narrow, crooked lane which the parish authorities at various times slightly improved because before the making of the turnpike road and the building of Buckland Bridge this was the route of the coaches, road waggons and other traffic to Canterbury and London. The earliest record of expenditure on this road specially noted was in the very severe winter of 1776 when the snow along this land was, in some places, 20 feet deep, and men were employed by the parish to throw it into the adjoining fields, to allow the London coaches to pass. In the year 1861 this road was slightly widened between Barton Farm and Cherry Tree Lane, to provide work for a large number of men who were left without employment when the railway tunnels under Chapel Mount, the Priory Hill and the Western Heights were completed. The mayor Mr John Birmingham collected £150, which was devoted to that purpose. Nothing further was done to Barton Road for several years, because the northern end of it had no proper outlet. In 1891 when the question of widening Dover’s narrow streets was being agitated a beginning was made here, and the Corporation purchased from Major Lawes a piece of land to open Barton Road into the London Road at Buckland Bridge. That land cost £1,495, and when the new route through it had been made, the building plots on either side of it were sold for £2,125, and after the expenses of acquiring this land and laying it out were paid there was a profit of about £700 left. It became necessary, however, to provide additional sewerage which cost £839, so that the actual cost of the new opening to the ratepayers was but a little more than a hundred pounds, which has been repaid again and again by the enhanced rateable value. Between Buckland Avenue and Cherry Tree Avenue the road was widened on the west side a distance of 376 yards, the land for that purpose being purchased from Mr Henry Webb, being a slice of his grazing ground at the corner of Cherry Tree Avenue, and from Mr Kingsford, being a part of Mr Prior's Brookfield Nursery. Below Minerva Avenue, on the other side, the land for widening was given by Sir William Crundall and the Ecclesiastical Commissioners; but, for the widening of the Frith Road end, compensation was allowed to Messrs Clark the nurserymen and to the Trustees of the Charlton Girls’ School. Those several widenings and also the widening of Cherry Tree Avenue at the same period, provided for Dover one of its finest suburban thoroughfares. 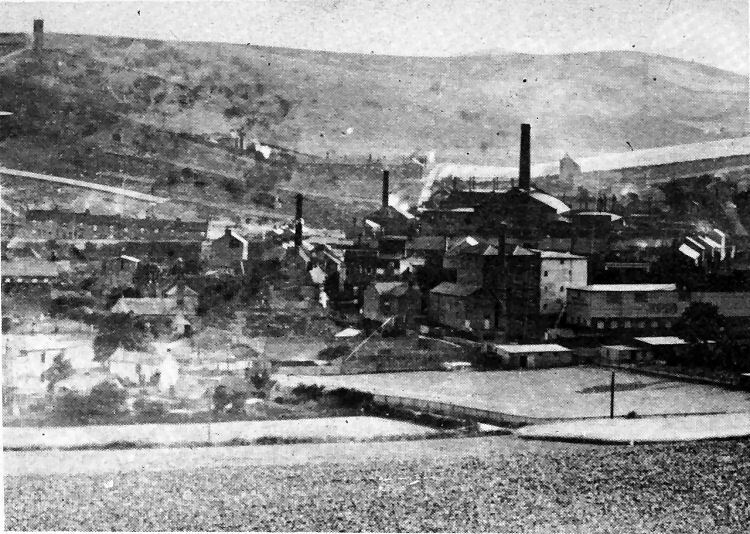 Mannering’s flour mill, part of which survives at the junction of Lorne Road and London Road, with Dover Gas Works, off Coombe Valley Road, in the background, pictured a century ago. On the sky-line is Diggle’s Folly about which little seems to have been recorded. 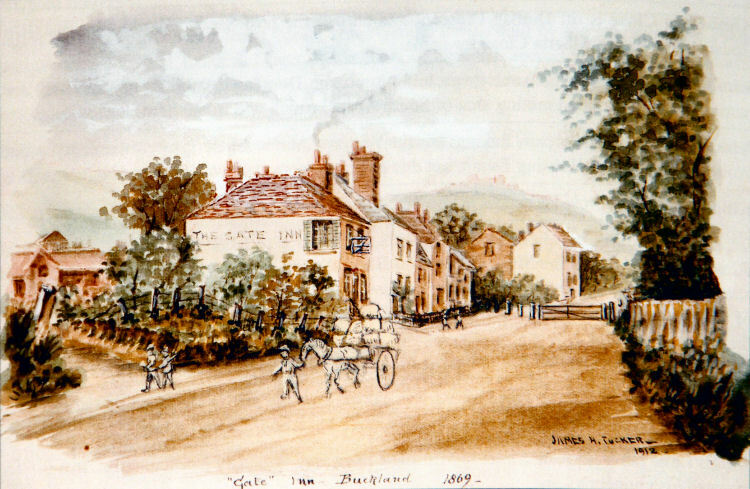 The picture, above, is a water colour by James H. Tucker showing Grabble Hill in 1869 with the old toll-gate some distance away from the Gate Inn. The picture is owned by former ambulance driver Mr Joe Harman who also has a copy of a picture by the same artist depicting the old windmill and Kingsford’s brewery at the foot of Coombe Valley Road.